Material and Finish: “Seal Skin Brown” powder-coated steel posts with IPE Brazilian walnut wood top rail. Description: Ithaca Style cable railing custom made with long posts buried into the concrete. When the Rosamond Gifford Zoo in Syracuse, New York remodeled their south entrance, they wanted to make it a natural oasis. We had the pleasure of working with Zoladz Construction and EDR Companies to create a relaxing entryway for the city’s zoo. 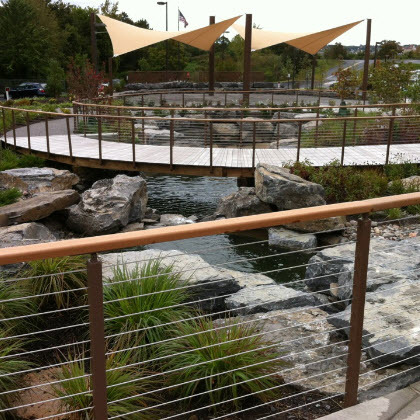 The entrance now features a stream that flows through a garden with a footbridge and a canopy of sail shades above. The architect chose our Ithaca Style cable railing because of its transparent design. Because of the bridge’s organic shape, we created a custom pivoting top plate to accommodate the changes in gradient. We also made the railing posts longer than our standard design so they could be buried in the concrete. The bridge’s underlying structure doesn’t follow the curvature of the deck’s surface, so we custom made each railing post to connect to the structure underneath. To make the railing blend in with its natural surroundings, we used “Seal Skin Brown” powder-coated steel for the posts and IPE wood for the top rail. We also fabricated a lockable pedestrian gate that allows service access to the water feature.